2019 Honda Fit Named Among Best Cars for Dog Lovers. The 2019 Honda Fit was named among Autotrader’s list of the 10 Best Cars for Dog Lovers. The list looks at vehicles that offer drivers spacious and versatile interiors as well as dog-friendly features. As the only subcompact car on the list, the Honda Fit is an affordable and versatile way to transport your pup. It also comes with a number of available cargo accessories that makes your dog more comfortable and helps drivers keep the Fit clean. 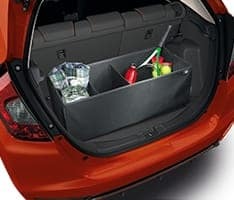 The Honda Fit features a tall roof, low step-in height, and plenty of space inside with versatile seats that can be rearranged in several different configurations. The second row is a Magic Seat that can be folded at a 60/40 split, allowing drivers to rearrange the interior into several different configurations. When you fold the rear seats down completely flat it will reveal up to 52.7 cubic feet of space, ideal for pups to sprawl out for the ride. Even the largest breeds will have plenty of room. 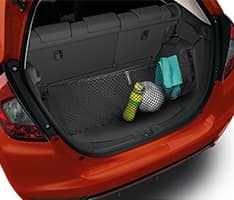 The Honda Fit also has a number of available cargo accessories that make your dog more comfortable and help keep the interior clean. Cargo covers and liners protect the interior materials from dirt and dog hair, while cargo organizers and nets help keep the cargo area tidy, and free up more space for your dog. Cargo Liner – Protect the cargo floor, sides, and the backs of the rear seats with a cargo liner. Cargo Tray – Made of durable plastic, a cargo tray catches dirt and debris and can be wiped down easily with soap and water. Cargo Net – Keep groceries and other items upright and prevent balls from rolling around on turns or stops. Cargo Organizer – Collect smaller items together and free up more space for your dog. Rear Seat Covers – Protect the rear seats from mud, dirt, and dog hair. Find out more information on the 2019 Honda Fit by contacting us or visiting your nearest Central Illinois Honda Dealer. Explore current offers and experience the versatility of the Fit first-hand with a test drive today!